Sail changes. It's what we do. We also read, sleep, try to sleep, and eat relatively small portions of food on occasion. On watch, I lay in the cockpit staring up into the night sky watching the windex on the top of the mast. It points left a little. It points right a little and occasionally pauses for a second to point straight backwards, east. The boat is rolling side to side. Down below Connie's foot is rolling side to side with the roll as she sleeps with pillows on either side or her. On the settee, Scott Tobiason gently snores on. He's wedged in also. Sail changes. Yesterday we went to hoist the geniker.(sp?) It's kinda like a spinnaker sail but has a tack fitting at the bow of the boat and only one active sheet. When we deployed it the sock rose about 1/3 of the way then stuck. After three quarters of an hour of futzing about we gave up and stowed the big old sausage below in the cabin. Then we dropped down the spinnaker pole and pulled it out to its extreme length. We clipped the starboard side genoa sheet on the end, rigged its topping lift and preventer then slowly rolled out the enormous genoa. Once we had her polled out to the side, the rocking of the boat filled then failed, over and over, the sail coming to with a big slap. Next we pulled up the main, double reefed, got her sheeted in properly with preventer also, the whole shebang out to the port side. Now we're talking.. a proper wing-on-wing. With a sail out on either side the violent roll was dampened. As it rolled to the starboard the main would dampen it. Roll to the port and the genoa did the dampening. All this worked great until night came upon us and with it a lessening of wind force and increasing of sea height. Come midnight the boat was creaking and jumping and complaining. Nobody could sleep for all the noise. So we (all hands on deck) took apart this wing-on-wing contraption with all its preventers and lines and halyards and sailcloth. That took us almost an hour to get everything stowed. We left up a scrap of main, sheeted and prevented out to one side. Engine on, we motored the rest of the night and all the next morning. The two Scotts spent hours in the cabin pulling the geniker out of the sock and re-running the control lines inside the sock. Then we hauled it on deck, carefully laying it out. Re-lead a line or two, take a twist out, shorten a painter, then hoist it we did. Suddenly a dull grey day was brightened by the loud yellow and green nylon monstrosity, blossoming out in front of the boat.. Connie killed the engine. "Thank you, Beta. Job well done." And so our night time speed of 5.1 is balanced by our day time speed of 3.2, giving us what we need for miles run in one day: 111 nautical miles. It's slow, no doubt, but the upside is that it's more comfortable. Later, at nightfall, we'll snuff the geniker and pole out the jib again. Even though it won't give us the same performance in light airs, we'd rather have it to bring in later than the finicky geniker. Look out! Connie's getting out the accordion. Now that will put some air into the sails. Hurray! We have sailed halfway around the planet... er, hmm, make that halfway across the Pacific... well that is, the Pacific ocean between Cabo San Lucas Mexico and Hilo Hawaii. Shellbacks no more, we are seasoned mariners. Ha! To celebrate Connie is making pancakes, no small feat considering that King Neptune turned up the fun house level this morning. We motored for 8 hours last night, caught up in the approaching high pressure to the north. It is moving south into our territory, bringing with it light winds. If you are following us on the Delorme In Reach you can see that we've turned south somewhat to get away from the high. See how the pacific high is just north of Hawaii? This shot I added later once we got to Hawaii. Our approximate location, if you want to find it on that NOAA map is 21.5N 133W. We are trying to skirt the bottom of the high pressure so as to keep wind in the sails. We are also measuring our diesel fuel so we know just how much motoring we'll have to do. At night when the wind drops we'll not want to fly the lightweight gennaker (too risky dousing it if the wind pipes up) so when the wind drops, we'll crank up the diesel and let her run at about 1400 RPM so she sips fuel at about 1/2 gal per hour. Then we'll take our shifts and be able to sleep. So there you go. Halfway there. Can't turn back now. Our fate is in your hands. Send us good thoughts. Drink a beer for me. Have a couple. All is well aboard. We are coming up to the halfway mark late this evening, and are looking forward to that accomplishment. Otherwise, the days and nights seem to blend together. A pattern has developed with the wind and waves that we've come to expect each day. By noon the wind is steady and the seas are high. By later afternoon the wind is the same and the seas are even heavier and confused. After sundown the wind slowly drops but not the sea. Sometime around midnight it is Hell Hour when we have trouble keeping the sails full while the seas slam us from side to side. There are a couple of things we do to fill the head sail. 1. Turn upwind to bring what little wind there is up to a beam reach. 2. Flatten the main and bring it more to center so the wind can get to the genoa. 3. Roll in the genoa until it lives forward of the shrouds, catching the wind coming across the side of the boat. If it collapses, at least it does not foul in the shrouds. 4. Drop the main entirely. Downside is that we loose some stability. 5. Turn on the engine. 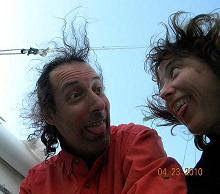 When our speed picks up we create our own wind which can fill the genoa. 6. Pole out the jib. Or, when it is Hell hour we can roll up the genoa, turn on the motor and power through it all until the wind picks back up. This charges the batteries and steadies the boat as well. After Hell Hour we get into the bulk of the night hours where we try to keep everything quiet so that the crew below can sleep. Pre dawn it is usually a little less lumpy and we are sailing just fine. Dawn and before noon is the best time of the day when we relax (sometimes catch up on the sleep we missed during a particularly rough night), enjoy the warmth, make a meal. Gotta go now. The wind has dropped. The sails are flapping. We are going to drop the mainsail and try poling out the genoa. Now don't you wish you were here with us? We could send you forward to flake down the main. Chafe protection, that's our job now. We brought the genoa back down to inspect the new halyard. It was somewhat scrunched where it enters the mast up top. Looking through binoculars and using the digital camera we could get a look at the exit holes in the mast head. There looks like some irregular surfaces on the port side. We chose to use the starboard side extra halyard when we brought her back up. I'm glad we have all those spare halyards now. If it squeeks, lube it. If it rubs, put some chafing gear there. If a line bounces across a shroud then rig it so it runs free. Yes we are on chafe protection patrol. Last night the wind dropped again but somebody forgot to tell the seas so we had another bumpy night of it. You know how you feel when you've been to massage therapy and you got a more intense work out than you expected. That's how I feel now. This ocean has been working on my back and shoulders and arms while I lie in bed. How handy! I get rolled this way and rolled that. We are all feeling better now, getting used to the sleeping shifts and realizing that there are just some things you do not do when it gets rough. I'm sure that all three of us are losing weight - we rarely eat a big meal, just grabbing something quick. Thank goodness we are well stocked with cookies and peanuts. Fresh veggies are just about gone but we have root vegetables that require more cooking. Just to feel better, I cleaned myself up and shaved on day five. Scott Tobiason did laundry. Connie played music. So we are slowly getting life back as we know it. But it's a weird schedule to live. The wind is slowly moving aft. Beam reach most of the day. Mornings are calmer, afternoons not so much. Night time is bumpy til late. Last night the sails were flapping so bad that our only recourse was to fire up the engine and power through the waves. When the boat is moving forward at 6 knots the keel keeps her steady. We had the added plus of getting a good charge on the batteries. We've had some communications from some of you and that's really nice to read. Feel free to use the tracking service to send a quick text. Or you can use this account. Just don't send any pictures and strip all unnecessary stuff out, such as my email text here. Oh yes, we are looking for crew for the return portion of the trip. Leave HI end of June, arrive in the pacific NW 20 something days later. After the noon sighting on day three the fisherman changed the lure on the big rod. A bird arrived and soared around the boat. Hmmm, something's up. Scott Tobiason looked out behind the boat and saw a Mahi Mahi jump once, jump twice. He yelled, "That Dorado is going to take the lure!" and zing, the line started stripping out. And so we had fresh fish for our afternoon treat. As the seas were somewhat down, we all felt a little refreshed, but life was still a little difficult, especially down below in the fun house. We are still doing our three hours on, six hours off shifts and are starting to get into a rhythm. But still we feel a little dumb as we stagger around. There is a point when the movement lessens where you can read but if the seas escalate you gotta just put the book down. We've discovered water coming into the boat where is shouldn't. Leak number one is forward in a cabinet above the vee berth. It's the place where the bow light wiring comes through the bow pulpit. We stuffed a towel into the cabinet. Leak number two is on the port side in a cabinet above the settee, probably the main chain plate is the culprit. Leak number three is very slight but annoying. It's in the deck prism above the quarter berth. Connie taped a diaper over it and it's absorbing just fine. Someday when the decks dry I'll climb out there and caulk the hell out of those three places. In Hawaii, I'll re-bed those areas. So not much new on this side. Still uncomfortable. Hungry. Sleepy. We watch the AIS gizmo and see the big ships passing us by. Last night I called one of the ships to see if our new AIS signal was visible and the radio operator said he could see us just fine. That's nice to know. This morning on my 6:00 to 9:00 shift the wind started building. By the time Connie came on at 9:00 we needed to reef the main. We did. I went below. Two hours later Connie yells down to me to come help. The wind and waves had increased and the Hydrovane self steering couldn't handle the weather helm so she was hand steering. I came up and helped get the boat under control by turning downwind, letting out the main, and rolling in the genoa. The seas built to 6 feet with the wind at about 15 knots. Scott Tobiason came up and we put in a second reef in the main and that seemed to calm things down. But here we are again, in big seas, too rough to cook anything. I'm holding down the laptop as I type. Oh, I almost forgot. Nautical miles run on day three = 127. Bleary eyed we settled down into our daylight portion of the day, spending the time napping and snacking. The motion of the boat eased during the day but still, to go down below was to risk entering "the fun house." Here in the fun house, up is sometimes down and gravity varies from moment to moment. I watched Scott T. doing a good job standing down below in the cabin, his body at 20 degrees to the floor, his arms pin-wheeling around to keep balance. We stagger and we leap going from one end of the cabin to the other. 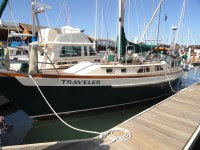 I'm wondering if Stan Huntingford, the designer of this boat, designed Traveler for passage making to Hawaii. Her galley is on the port side, as is her master berth. With a northwest, north, or northeast wind she will lean to the port all the way to Hawaii. Being on the low side, the galley is much easier to work in than if it was on the starboard side. As it is, you just fall into the galley instead of having to climb uphill to get there. Same thing for the master berth. Just fall into the stateroom and you are suddenly in bed! And thank you Stan, for giving us all those wonderful hand holds, nice fat solid things. I find myself being projected through the air and as I flail out with my arms inevitably I come in contact with one of those beefy marvels and it saves my noggin from crashing into the bulkhead. Down below, the farther you go forward, the more fun-house effect you get. In the back stateroom or companionway, you get a heave and sometimes a twist. In the galley, you are more over the center of gravity of the boat so the motion is less. On the settee if you lay head to the stern you can feel your feet launching themselves into the air more than your brain. Scott Tobiason sleeps in the settee and so far he has not fallen up into the air and off the bunk. Forward in the fun house is the little tiny room where you poop against gravity. You might be able to hold yourself parallel to the earth's core by using your thigh and calf muscles but that porcelain bowl is gyrating madly. Make sure your aim is good, get-er-done, as they say, and get out of that hell house as soon as you can. As for the Vee berth... don't go there. It is wild in there. Up, down, sideways, twist, triple sal chow, toe loop, camel spin. We are settling in, all proud of ourselves, when we hear the zinggggggg. Fish on! S.T. pulls in a wonderful looking yellow fin tuna. So beautiful. So elegant. She's about 4 pounds and provides us with a nice meal. Connie makes sushi rice to go with the tuna and it is a feast. What did we do? Was that an actual meal? Thus far we'd just grabbed whatever was handy to stuff in our mouths. Now we have a plate with two things on it. Now that's living! I'm going on 2.5 hours sleep at this point and the crew notices that I'm not thinking too clearly so they hijack my shift and order me to bed. The wind and waves have abated somewhat so that when I fall downhill into the master cabin berth I cover myself in pillows and drop heavily off to sleep - my first deep sleep is wonderful. That night the stars are out, the planets align and we all (on our various 3 hour shifts) enjoy the IPOD and music as Traveler grinds through the night. We decided to use noon as the start and end of each day's reckoning. We call it taking the noon sight, kinda like they do in Master and Commander. But we have not yet hauled out the sextant. Still, at noon, we take a reckoning, have a mini-meeting, and declare how far we have come and how far we have to go. We mark the miles run, S.T. puts out the fishing lines, and we watch the four foot wind waves crash over the bow. We are not getting much done outside of clicking off the miles but that's ok. I'm just happy that my mind is starting to function and that the boat is holding together. Scott and Connie and Scott, somewhere in the Pacific Ocean. I'm sending this blog entry via email to test our ability to submit entries via the single sideband radio. Once we start our Pacific crossing, I'll be sending blog entries, text only, on occasion while we are at sea. Note the yellow flag, was red the day before. This picture added later when we had internet access. Monday morning I paid for our extra night at the dock and we said our farewells. We eased Traveler out of the slip and slowly motored through the narrow canal towards the harbor entrance. Passing El Cid, we saw the yellow flag on its staff. The Port Captain had the breakwater entrance open. The dredge had moved into the center of the channel so we squeezed by it slowly and carefully. Connie was on the bow for a better perspective. The operator on the dredge motioned to her that we should veer to starboard as it is quite shallow on the port side of the dog-leg channel. We turned sharply across the channel to position ourselves to run the entrance. I could now see the rollers coming in, still quite high. We got her lined up and increased the throttle just as one of the rollers broke just 50 feet ahead of us. We've got breaking seas again.! Doesn't look like much here but it was quite rough getting out past the breakwater entrance. Traveler punched her way through a four foot swell. The next swell was a breaking wave that broke over her foredeck, cascading water down both side decks. Connie hung on to the shrouds and got her feet soaked as Traveler muscled her way out through the entrance. Depth gage down to 12 ft then up to 15 and 20 and we were in the big blue. I peeled my hands off the wheel and set the autopilot to head us north. After looking at the various wind prediction models on the internet I decided we needed to get some "northing" as the wind was coming directly from the west. A few hours later we raised both sails and took off on a starboard tack heading roughly southwest, beating as high as we could get. Soon we crossed the rhumb line course I'd set from Mazatlan to San Jose del Cabo. The seas were quite choppy with multiple wave trains coming from northwest and south. Four hours later we tacked north again and held that close hauled course for another four hours, crossing our rhumb line once again. I sure hoped the wind would veer. Tacking our way all the way to Cabo would cost us an extra day. The next time we tacked we made better westing as the wind was starting to clock around more to the northwest, but still we were loosing latitude. We continued on into the night through lumpy seas. Sleep was difficult, illusive. At 04:00 AM the wind dropped completely but not the seas so we motored northwest to try to get back on our rhumb line. Later that morning the anticipated northwest wind came up and now halfway across the Sea of Cortez we finally were able to sail in the direction we wanted. The further west we got, the easier the seas became until we were able to get some uninterrupted sleep. When the seas are rough you might catch a few minutes of sleep but when the boat crashes into a wave or falls off a wave it wakes you up. By this second day we were both pretty sleep deprived. Swapping naps, we sailed west, sighting land just before sunset. Off to our northwest we could just make out Cabo Los Frailes in the setting sun. You can see how the wind finally veered to the northwest. We sailed through the night, taking shifts: Connie, sundown to 21:00; Scott, 21:00 to 24:00; Connie, midnight to 04:00; Scott 04:00 to landfall at 09:00. On Connie's first shift we had to roll in the genoa and hot-foot it out of the way of a big cruise ship bearing down on us. Morning found us approaching the breakwater off the marina entrance in San Jose del Cabo. The crossing took us just about 48 hours. Long naps ensued. This is the wind prediction off the cape for Saturday when we plan on making our exit.